Thyroidcancerdoctor.com | Kenneth B. Ain, M.D. By Kenneth Ain, M.D and M. Sara Rosenthal Ph.D. Authored by Dr. 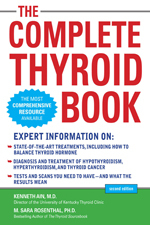 Ain and co-authored by his wife, well-known thyroid author M. Sara Rosenthal, Ph.D., this is an exhaustive, four-part, 26 chapter book that covers all aspects of thyroid disease. It contains all the detail anyone would want (or need), but is still written in plain language! From a husband and wife who “eat and sleep” thyroid disease in their personal and professional lives. Copyright © 2005 – 2013 by Kenneth B. Ain, M.D. and the authors. Last modified: October 10, 2013.